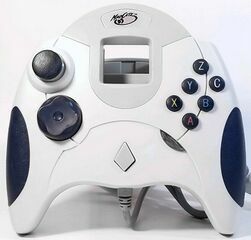 The Dream Pad is a third-party controller manufactured by Mad Catz for the Sega Dreamcast. Dream Pads are among the most common third-party controllers for the system and were sold in a variety of colours, including white, red, orange, green, blue, purple, black and transparent. The white addition came first and was packaged in a cardboard box - subsequent colours were distributed in blister packs. As well as providing the user with all the basic Dreamcast controller functions, it re-introduces and buttons, can act as digital versions of and . These two buttons are programmable via a discrete semicircle button near the button, making the pad more useful for fighting games. It also has rubber grips and larger than the standard pad, making it arguably more comfortable to hold. The controller is not without its flaws. Though the thumbstick has a rubber layer on top, this layer is prone to falling off after repeated use. Furthermore the back triggers can get stuck. A small batch of Dream Pads were sold to North American Toys R Us stores with High Frequency branding. See Dream Pad (High Frequency) for more information.